In my review of current release Kung Fu Panda 3, I noted that many animated features offer much more in terms of depth of storytelling and character development than many live-action movies. These stories also come with a solid message contained within; a message that is usually subtly and genuinely delivered. This is also very true of Zootropolis, the latest animated flick from the daddy of all animation studios, Walt Disney. And, early though it may be, it is undoubtedly a strong contender for next year’s Best Animated Feature Academy Award. While a storyline that tackles the hot, and perennially divisive, issue of racial equality and harmony (especially in the US at the moment, as various colourful candidates slug it out for the presidency), Zootropolis is a must-see for children and adults of all ages. It reaches Pixar standards of insightful, funny and exciting story-telling; its inspiring and positive message delivered with infectious humour by a menagerie of well-rounded characters and set against the backdrop of the breathtakingly beautiful titular city. In the first of many laugh-out-loud scenes, we are introduced to young bunny Judy Hopps (voiced by Ginnifer Goodwin), as she adopts some skilful – if overdramatic - acting tools in her annual school play. Her infectious ambition and enthusiasm have certainly not been inherited from her conservative parents, who – via their loving, yet overcautious, methods of parenting – offer her words of wisdom along the lines of “if you don’t try anything new, you’ll never fail”. Luckily, Judy’s independent spirit wins out and, after attending a finishing school she realises her dream of attending the police academy. After successfully completing her training and becoming the first rabbit police officer, she is posted to Precinct 1, in the centre of Zootropolis. Judy is gutted when she is assigned parking duty and – in the first of many moments when you almost forget you are watching an animated movie – the film superbly captures the common fears and initial disappointment that often come with the first day on the job. Yet, Judy soon finds herself embroiled in a sinister case of missing mammals and, with the help of wily fox Nick Wilde (Jason Bateman), she sets out to solve the case – which she has to do within 48 hours or she will lose her job. In Judy’s perennially optimistic sunny bunny, and Nick’s cunning, charming and cynical fox, the film offers two diametrically-opposed characters, which is the basis of any good buddy movie. And the chemistry between them is palpable as they overcome their differences to solve the case and, in their relationship, lies the nub of the storyline. The basic story has predators and prey from the animal world living in tentative harmony. But, when some residents suddenly turn savage; natural instincts come out, leading to suspicion and, ultimately, hatred. It must be said that, for a family film, it goes to some pretty dark places at times. But it comes back into the light with a sound and exceptionally topical moral message. Adults will be impressed by the positivity, subtlety and power of this message; the younger ones, hopefully, inspired by the funny and touching friendship that saves the day. Zootropolis combines old-school Disney animation with modern CG technology. 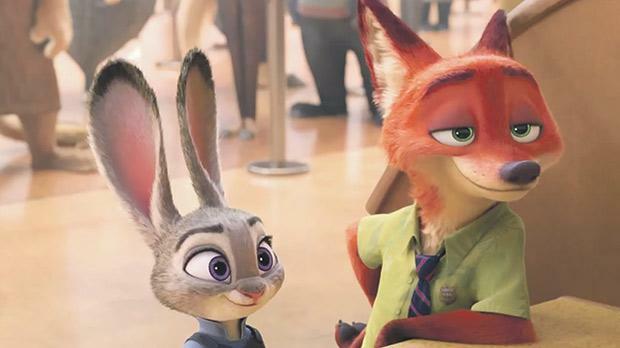 There is something achingly familiar in the designs of the characters – Judy boasts Thumper levels of lovability; while Nick bears a strong resemblance to Disney’s 1973 rendition of Robin Hood. The rest of the anthropomorphic ensemble is exquisitely drawn. The animators have also created a beautiful metropolis with different areas; each composed of a different palette of vibrant colours and rich textures and providing the myriad environments that accommodate the dozens of animal species with their perfect habitat. And so, the warm yellows and oranges of Sahara Square sit alongside the whites and blues of Tundratown, the lush greens of the Rain Forest District and the wide open countryside spaces of Bunnyburrow.